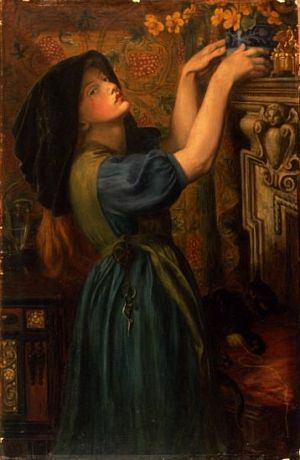 ‘Marigolds’ or The Gardener’s Daughter by Dante Gabriel Rosetti was an inspiration for my Harlequin Historical romance ‘Enticing Benedict Cole’. 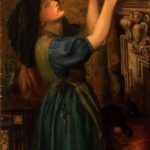 The beautiful, romantic Pre-Raphaelite paintings are some of the most familiar artworks in the world. During the 19th century, the art and love lives of the Pre-Raphaelite Brotherhood, a group of brilliant, free thinking young men, were considered scandalous. Their artistic milieu was in complete contrast with the strict conventions of the Victorian upper classes who lived in a controlled, stifling world, and they were often trapped and unhappy. It would have been considered unthinkable for an aristocratic young lady to want to pursue art seriously, and even more unthinkable to be an artist’s model. That’s the dream of Lady Cameo St Clair, the heroine of my Victorian romance Enticing Benedict Cole. Her story celebrates every woman who ever challenged convention for the sake of art, and for the sake of love. It is published by Harlequin Historical. 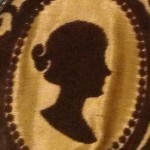 Another Lady who is capturing the imagination of readers is Lady Godiva! THANK YOU to all the readers who have read and reviewed Naked: A Novel of Lady Godiva. Her story deserved to be written – and I’m so glad it is being read! The famous image used for the cover of NAKED: A Novel of Lady Godiva was painted by John Collier in the Pre-Raphaelite style (1898).